On the 8th October 1960 Len Outtrim was working on his boat ‘MAGLENDA’ in Weybridge Marine boatyard. At the time Len was wearing a Gieves yachting cap, complete with white duck cover. Terry Tappin came along and commented “wish I had a cap like that”. Len, who at the time was a member of Wey Cruising Club, replied light-heartedly “well, why don’t you join a Club then you could get one of your own”. Terry's response was "why don't we start one here ?" This remark was heard by Ernie Kemp on board ‘MEBA’ who said “that’s a good idea, let’s approach other boat owners in the yard” and, like Topsy, the idea grew during the rest of the day. On the following Sunday morning, the 9th October, 1960 an inaugural meeting took place in the cockpit of Ken Davies’ boat ‘NOKOMIS’. The name Weybridge Mariners was born by simply adding “rs” to Weybridge Marine, a bright idea by Charles Gautier who also thought up the design for the Club Burgee as it still is today, two cross marlin spikes with W.M.C. interspersed and surmounted by a three bladed marine propeller. From these humble beginnings has come the club we know today. Initially club meetings were held in the yard workshop. Len's wife Maggie would clear a space for seating, consisting of wooden planks resting on the top of oil-drums or whatever else was lying around. We also managed to brew up a cuppa on the coke stoves. Later as the club grew we held meetings in the Old Crown public house in nearby Thames Street. The first dinner dance was held on the 19th November at the Ship Hotel in Weybridge which also happened to be the birthday of Bob Tappin also known as Skip, one of the founder members. It was a very successful event and resulted in getting the club's name more well known which resulted in more members enrolling. The offer from Skip Tappin that we use part of Wey Wheat Barge called Greywell, if we would be prepared to help with the conversion to make it habitable was accepted. This was done by putting a lantern roof over the main hold and some bulkheads in to divide it into two. The stern half of the barge was to be used by the club and was fitted with some seats from bus conversions. A small galley and toilets were also installed (bucket and chuck it). A bar in the shape of a dinghy on end was fitted and the original crew quarters right became the beer store. For this we paid a nominal sum of £2 per year. We had some wonderful happy evenings and interesting discussions on boat handling, navigation and items of boating interest. As the membership grew, we were able to purchase the whole barge. Sadly, the barge was taking up too much room in the yard, but fortunately Harmsworth Wharf became available at the entrance to the Wey Navigation for the club to rent it from the Thames Conservancy as it was known then. Later, the Wey navigation was taken over by the National Trust who claimed we were on their water and also charged us rent. It meant that the club had two landlords. Our only access was by water, so the club purchased a ten foot open dory propelled by a water jet engine. Because of the heavily tree lined banks it was always getting blocked with leaves despite filters. A special rake had to be made to remove the leaves, this was alright in the summer, but as one had to put an arm into the water to do the cleaning, not so good in the winter. We modified the stern and fitted an outboard engine, this served us quite well. In 1971/72, our bar license came up for renewal, resulting in an inspection by the local Health Officer. He didn't like our Elsan toilets or the fact that we didn't have any mains water. The lighting relied on a small Honda generator, loaned by one of the members. The Health Inspector gave us a year to do something about this situation. We began to think it was curtains for the club as we had tried unsuccessfully to get a mains water supply for several years. Then out of the blue came what seemed a miracle, A group of Thames Conservators, headed by Lord Nugent of Guildford, visiting Shepperton Lock on an annual inspection of Thames Conservancy properties, they came round the Dock and Slipway (this is the official title of the Clubhouse site as we know it today) The large wooden building over the slipway (this is now our Clubhouse and Headquarters) was in a somewhat dilapidated condition, Lord Nugent enquired as to what it was and who the owners were, commenting that it looked very dangerous and should be demolished, he was somewhat taken aback to find that the Thames Conservancy were the owners. 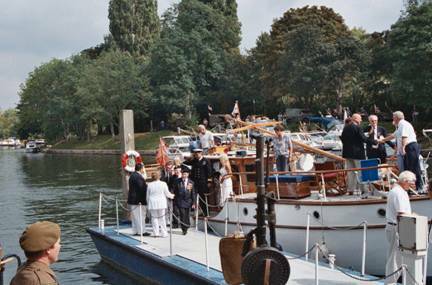 Accompanying Lord Nugent in the inspecting party was "Nobby" Pearce, who as well as being a Conservator was Chairman of the Association of Thames Yacht Clubs (ATYC). He said that he knew of a boat Club who might be interested in turning it into a useable Clubhouse and Headquarters for them. It transpired that he was unable to contact the people he had in mind, but in the mean time Ron Sargent, Commodore of W.M.C. along with Len Outtrim the Clubs ATYC representative had approached "Nobby" about the building at Shepperton. The outcome of this discussion was that the T.C. would offer us a one year lease providing that the building was made safe and habitable at the end of the one year lease. One of our members at the time was a civil engineer and drew up a set of plans along with a schedule of materials required these were submitted to the T,C. who approved them. As a result arrangements for the forthcoming work were put in hand. 1972 was a grand summer and one to remember, Peter Clark,a master Carpenter with a London company along with Don Crease ,a Surrey C,C, Highways Surveyor set about organising the work, the first job was to make the building waterproof, this entailed stripping in sections the tiles from the roof and at the same time replacing any rotten and suspect timbers and treating all woodwork to the roof against dry rot and woodworm, the tiles were originally held in place with wooden pegs, these were replaced by galvanised nails While the work to the roof was progressing work was under way down in the slipway area Don Khaan, Vic Dillon, Derek Bale, and John "the blacksmith" Sherwood, along with other willing hands manufactured the steelwork which was to support the floor and tie the vertical timbers which supported the roof trusses, all the fabrication required prior to erection was carried out in Don's works. On completion of fabrication the steelwork was delivered to Terry Tappin's yard and transported to Harmsworth wharf by Terry's crane barge. Some of the Ladies then set about it with wire brushes prior to coating it with red oxide paint, when dry Terry then with his barge moved them to the slipway ready for erection, prior to the next major operation, installation of the floor. Such was the enthusiasm that members living local would turn up straight from work and get stuck in on whatever job was in hand ,work would only stop when it was to dark to carry on. Weekends were given to getting as much done in two full days as was possible, all his time the weather was kind to us. When the erection of the steelwork was complete the job of laying the supporting timbers for the floor got under way under the watchful eye of Peter Clark We heard of a dancehall in Woking was being demolished and we managed to get our hands on a lot of the sapele from the dance floor, this was delivered to Weybridge and was transported across by the Club dory. The Ladies the set about de-nailing it, tough work and fraught with splinters, which if not dealt with straight away were liable to fester, heavy drain on our first aid box (not much call injuries compensation under Health and Safety in those days). When the lads came to lay the flooring it was found to be of a very uneven thickness and was taken back across by the dory in order that Terry could put it through his thickness planer, a messy job that created a mountain of shavings which we found easier to clear up as we went along. Once again the Ladies came to our rescue. Whilst all the work was going on above, below, Bev Shields, who had only joined the club the previous year, took on the installation of the new toilets and showers in the ground level lean-to structure. This encompassed setting out and laying new drains which required accuracy to ensure all the outlets were correctly positioned since they would later be buried in concrete. He then fitted the new WC;s, wash basins and showers with the associated plumbing The job was completed by laying the floor screed in the toilets and along the corridor including rendering the internal walls and fitting an external waterproof plinth.. Bev maintained that any bumps had to be attributed to the fact that he did all the work with his left hand as he had suffered a nerve injury to his right hand. Doug Painter, who had a business in Send used his laundry vans to run around and collect items required which had been sourced by members. Through members we were able to obtain a lot of materials which were going to be dumped. Panels with a bird's eye maple finish were fitted around the bar area and some were utilised as partitions and doors in the toilets. A hundred foot length of red leather upholstered banquet seating, together with twelve tiled top tables, a stainless steel sink and three Bain Marie hot cupboards were obtained for one hundred pounds from a restaurant that was being re-furbished. The frontage to the river was extended and fitted with metal framed windows and doors purchased from a scrap yard and we got a firm of glaziers to fit the glass on the basis that they would be better than us. (If they broke any glass they would have to replace it). Don Khaan and his gang built a fine steel balcony at the front and fitted it with decorative safety rails. Two iron staircases were installed as fire exits from the main building. After finishing the main floor, Peter Clark with the help of a few others, built the galley, bar and the entrance hall and staircase from materials which had been salvaged from some houses that were being demolished. They also fitted out the toilet cubicles once the soil drainpipes and wash basins had been fitted. At the back of the building Philip Harvey, his family and others dug out a ten foot by ten foot by ten foot deep hole so that a septic tank and french drainage tank could be constructed in concrete with four inch plastic piping for drainage. The system coped fairly well when forty or fifty people used the clubhouse, but on special nights when attendance was nearer to one hundred to one hundred and fifty it would tend to overflow. Once people started to make their way home it would recede and return to normal the following day......PHEW!! Kevin O'Brien overhauled the side windows in the clubhouse replacing glass and frameworks as necessary. Ron Nunn installed all the electrics for lighting etc. (this has since been overhauled and rewired as necessary by Charlie Sparry). Len and Maggie manned the concrete mixer with the help of several volunteers built the beer cellar amongst other things including the concrete for the septic tank. All the ballast used came from the river bed using Terry Tappin's crane barge and was transported on to the site. All the wrought iron work for the bar and light fittings were made by Don Khaan, Vic Dillon and John The Blacksmith this wrought ironwork has been a source of envy by other clubs when visiting us. Hazel James along with some other ladies made curtains for the windows. Cooking stoves were installed in the galley and the bar was stocked ready for opening day. During July/August 1973 the Conservators visited the site to make an inspection of work in progress. They could not believe that a bunch of amateurs, led by only a few professionals could transform such an old building into such an attractive venue. There was no hesitation in granting a thirty year lease. Nobby Pearce donated thirty gallons of white paint and we were able to paint the outside of the building. On the 27th October 1973 Nobby Pearce officially declared the Clubhouse open. He gave the Club his blessing as did other Club Commodores and Flag Officers who had been invited along for the opening ceremony, after which a dance took place until late. To raise money for the building we ran raffles, tombolas and sold £5.00 interest free bonds to members, with a maximum holding of £200.00 along with a promises to repay the bond in five years, this raised about £2,500.00 and we cleared this debt within three years. Many of the members who invested small sums donated their money to the Club . The staircase to and the storeroom over the Club Bar was constructed by Peter Collins assisted by various Members. The shelves to the storeroom were modified by Frank Miller in order to facilitate easier access.. The Patio, to the upstream of the Slip, including Brickwork and Metal Railings was the work of Martin Small assisted by his wife Carole, the mooring post were made and fixed by Vic Lundberg, The reason for the upstream post being tall was to make it easy for the Crew to throw a line over. The original fence was suffering the ravages of time and on this fact being pointed out by our Landlords, Terry Carthew assisted by Vic collected and renewed the fence to the satisfaction of our landlords. The floor at this end had suffered a form of rot, this was cut out by Len Baker and replaced using sections of the floor timber which adorned the front of some of the banquet seating. The original flight installed during construction of the Clubhouse had become dangerous and was replaced by Frank Miller. Numerous other jobs which have contributed to the smooth running of the Club have been carried out by members who gave their time quietly and freely"
The original ceiling followed the contour of the roof this resulted in a considerable loss of heating during the winter months, this problem was remedied by Vic Lundberg who assisted by his wife Joyce installed the ceilings existing today, this resulted in a marked reduction in the cost of heating the Club. Also at this time Len Baker made the shields and staffs for mounting the various flags and pennants that we had been given during social visits from and to other Clubs. In 1974 we hosted the Association of Thames Yacht Clubs Annual Rally with over 200 boats in attendance all moored along the wall opposite the Club. With this number of boats attending it meant that in excess of 400 persons would be around, In order to ease a possible problem we erected a marquee on the green in front of what is now Canoe Club premises, in the marquee we installed a bar and in the evening music. the activities in the marquee were run in parallel with activities in the Clubhouse. All over the weekend our Ladies provided food along with non stop tea and coffee. As membership grew so did the activities we got involved in, such as a yearly water carnival, Christmas parties for the children and grandchildren of Members, Father Christmas was always in attendance and arrived at the Club by Thames Police boat with all lights flashing. The officers from the police station next door (where the E.A. are now installed) provided the boat and crew. For a number of years we took part in the R.N.L.I. Annual rally which, until the fire, was held at the Lensbury Club. After a fire it moved to Queens Promenade Kingston, during this period we regularly entered for the Whittaker cup and were successful on numerous occasions. In 1997 at a suggestion from Jan Walker, she had got involved with the Charity involved in bringing children over from Chenobyl, we laid on a full days entertainment for the children including a river trip food and entertainment and on leaving were given a backpack with various presents in. This event went on for three years. We have within the Club a close connection with the Association of Dunkirk Little Ships and through this connection we got to hear that the annual river trip that the Dunkirk Veterans took every year was to cease due to increasing cost. As a result it was suggested that if the Dunkirk Little Ships based on the Thames provided the river trip we would entertain them to lunch, this was a successfully enjoyed by all involved, as a result this has become a regular event in our programme and we have an undertaking that we will continue this event until the last Dunkirk survivor is fit enough to make the trip and wants to do so. It was on the 2nd March 2006 that disaster struck. Chris Knight who was Commodore had a call at 4 am at home from Bob Smith one of our members who worked as the local Environment Officer at the E.A. building next door. Fire had destroyed the total building and we lost everything including all the Honours Boards and Display Cabinets housing all the silver cups. Worse still was the discovery that our insurance cover which had been based on updated valuations of the building which had been built by the members in the early seventies; was woefully inadequate to meet the cost for rebuilding to 2006 standards. Not only did we have a fire but to compound our problems we were in the process of renegotiating our lease with the E.A. The cause of the fire was unknown. Forensic investigation would have had to have been paid for and as our cover was already too low, there seemed little point since our insurers paid out irrespective. As previously documented in this History account; when the club was initially converted for our use from the Thames Conservancy boathouse back in the 70’s; we had many members with the necessary qualifications and skills. Post the fire we still had members with considerable skills. Ray Churchill was an Architect and Charles Worby a Building Surveyor. Two sub-committees from club members were set up. The first was the Rebuild Committee headed by Ray Churchill. Serving on this Committee we had Roger Francis who had considerable building experience. He was to undertake the position as Clerk of Works. The other prime members were Vic Lundberg, Charles Worby, Frank Miller, Jim Kelly and Gary Musgrove. The second sub-committee was the Fund Raising Committee headed by the Vice Commodore Frank Gaylard. Ex Officio members comprising the Commodore, the Secretary Chrissie Drummie and the Treasurer Angie Jenkins sat in on the Committees when appropriate. The Rebuild Committee decided that the initial work would be carried out by Gerry Harris who was a self employed building contractor. He and Keith Davies undertook the work that was considered unsafe for the rest of the members. Once it was safe, other members joined in. Bob Smith was able to help us with disposal of waste materials by river. Almost 10% of the insurance cover was spent clearing the site. Ray Churchill drew up plans under the umbrella of Axiom Architects where he worked as a director. He submitted all the plans to the E.A. who had no objection. The fact that Bob Smith was virtually on the doorstep no doubt ensured that things went faster than might have happened without his co-operation. Also, we had huge support from Steve Newman our resident Lock Keeper not for getting Sandra his wife who supplied teas on many occasions Following on, Ray liaised with the Local Council and put the rebuild plans out to tender. This resulted in the work being placed with Ian Parkinson Bryant Construction Ltd. who had built the new Gibbs' boatyard premises just down river from our clubhouse. Ian was exceptionally co-operative knowing of the club’s predicament with limited finances. He agreed to do as much as possible within our budget. This meant that our initial requirements were dramatically cut back. Parkinson Bryant would take on the main structure including new steelwork and that once the outer walls, floors and roof had been completed members would work on building all the internal stud walling, undertake all plumbing, electrical and internal decorative work. Charles Worby liaised liaised with Gerry Harris on trial inspection holes to establish the stability of the existing foundations for supporting the rebuild including the additional steel work for the re-designed roof. A structural engineer was called in to determine whether the original steelwork could be retained. Fortunately it had survived with little damage. In order to keep the club membership together the club was able to negotiate a favourable rate for the use of JGF Passenger Boats ‘Walton Lady’ from John French which moored just upstream of the clubhouse site every Friday evening. Members continued to meet and Committee Meetings were held on the top deck when required. 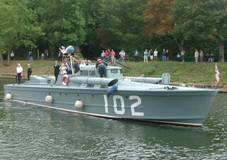 One of our concerns with having no clubhouse related to our commitment to host the Dunkirk Veterans on their annual visit aboard the Little Ships. John French again came to the rescue and provided 2 of his vessels from JGF Passenger Boats for the visit on the 10th September 2006 free of charge. The shortfall on our insurance cover was the reason we set up the Fund Raising Committee under Frank Gaylard our Vice Commodore. We desperately needed funding for the internal work. Plans were made to hold a Mariners’ River Festival at Shepperton Lock on the 16th September 2006. This event was backed by the Environment Agency who were keen to promote interest in the river. Invitations to boating clubs and other organizations were sent out. It was a great success thanks to the involvement of all our members who were able to participate. Angie Jenkins organised the supply of marquees which were collected by Peter Adams in his truck with help from many of the members. Everyone turned to erect them by the lock and in Steve Newman’s garden. Stalls were set up with for club members Sally Holdaway, Margaret Bond, Joyce Lundberg, Sian McCoy, Jean Francis, Pat Borsboom, Glen Lavier, Heather Gaylard, Annette Harris, Wendy Hurrell, Maureen Lawrence, Su Knight and Ann Fowler among others providing cakes, jams, marmalade pies and chutney. Other stalls were taken by the RNLI and others selling jewellery, craft items, perfume, books etc. River trips; courtesy of Bev Shields at Chertsey Meads Marine; were set up with donations going to the Mariners. JGF moored the Walton Lady alongside with a Pimms Bar with smoked salmon and cucumber sandwiches on the upper deck run by Bill and Angie Jenkins. Bill McCoy ran a hot dog and burgher stall, Past Commodore Mike Higgins donated a weekend in Paris for 2 as the major prize in the River Festival raffle draw. Our Master of Ceremonies for this event was Arthur Bond who gave all the announcements and told everyone what was on and where. The Festival was deemed a great success boosting our minimal funds. This success led to follow up annual festivals which further strengthened our rebuild kitty. Tony Riley from Bray Cruising Club and of Legacy fame came and played the organ and sang at the River Festivals. Marquees and stalls were again set up and we continued to add to our funds. Main functions during the rebuild were held at the Black Swan Penny Lane and the Village Hall in Shepperton where Bill and Sian McCoy covered catering on several occasions. The AGM was held at the Black Swan in 2006. Donations from other clubs and individuals were received. Mike Fowler followed Angie Jenkins as Treasurer and continued throughout most of the re-build watching the pennies all the way along. Frank Gaylard took over as Commodore followed by Vic Lundberg, Wendy Hurrell,Danny Rogers and Bob Boreham. They all contributed much to keep the club membership rallied. Work on the clubhouse by members really started when the builders had completed the main structure. Our main stay was Roger Francis who not only was actively involved with everything but also ensured that it all moved along at the correct speed and order. Further clearance and collection of building materials began. Peter Adams provided transportation both to and from the site. Everything had to be carried over the lock gates and members all turned to help. Much of the internal stud walling was built by Billy Barton who provided power tools in conjunction with Roger Francis. Helping with this work were Peter Budd, John McPhee, Frank Miller, Jim Hillier. Kenny Beard, Danny Rogers, Russell Doig, Jim Pothecary, Mike Fowler,and others. Vic Lundberg set about marking the floors as drawn out on the plans by Ray Churchill. Once the stud walling framework was up; plasterboard was fitted’. External walls were double skinned to meet fire regulations. Plasterboard also had to be fitted to the undercroft. A night shift with Frank Gaylard, John McPhee, Bob Boreham and others undertook this work. Gary Musgrove ordered all the electrical wiring and parts and almost single handed set about the installation. Although not a qualified electrician his computer background enabled him to undertake work that was new to him although it necessitated him studying the regulations to ensure that there would be no problem when the system was commissioned by a qualified electrician. Jim Kelly ordered all the plumbing parts including the boiler, radiators and piping. Jim previously had a plumbing business and although retired did most of the work himself assisted by Jim Hillier. In addition to Billy Barton who did much of the carpentry including making temporary staircases we also had the skills of Frank Miller who before retiring had a Carpentry and Joinery business. Frank undertook joinery work fitting out the galley and elsewhere as needed including banisters for the final outside staircases. Once all the internal walls were up; everyone turned to with help. Everyone included many of the ladies who not only provided food and drink on working weekends but also did much of the cleaning and painting. Outside all steelwork had to be rubbed down and painted. Trenches had to be dug steps erected and paths laid down. Roger Francis, Peter Budd, Bob Boreham, Kenny Beard , John McPhee and others were involved. The initial stairs on the riverside were made by Billy Barton to meet safety regulations for fire escape access whilst work was going on. The original wrought iron staircases were re-erected in conjunction with the new balcony. The balcony was another major task undertaken by members. Foundations were dug for additionally supporting steelwork. Steel sheets were delivered by river with the help of Keith Edwards from Middle Thames Yacht Club. Peter Towerzey erected a temporary boom at an angle on what remained of the original balcony. A block and tackle was attached to form a crane to lift the last sheets. Each one was drilled and an eyebolt fitted to connect to the chain lift. These sheets weighed in the order of a quarter of a ton each and were rolled into position using scaffold poles. Peter brought welding equipment and completed the balcony flooring. With help from Bob Boreham railings were sourced and welded into position with an additional scaffold pole railing modification along the top to meet current safety requirements. One of the later additions was the construction of a bar. Weybridge Mariners’ Club have not had the benefit of an income from mooring rentals and rely heavily on profits from bar sales. Frank Gaylard initially set up a system of trestles and boards When our funds had increased sufficiently with the income from the River Festivals and other organized events we were able to fund the current bar which was built by Billy Barton. As we progressed with the fitting out of the new build other measures were taken. Bill McCoy acquired flooring tiles which were laid. The dance floor which we had all enjoyed in the old club house was sorely missed. It was the generosity of Michael Phillips to whom we have to thank for our current beautiful dance floor. Barbara, his late wife used to love to dance and this new floor was laid in dedication to her memory. An awful lot of work was carried out by the members to get to where we are now. The new club house was officially opened by Chris Turner Chairman of the ATYC. This was thought to be a fitting follow up from Nobby Pearce his predecessor who opened it in 1972. Sadly, our President the late Len Outtrim was unable to be present but his grand-daughter read out a message from him. It has been a long hard struggle but the new clubhouse must be one of the best on the river. Of course there is still work going on. Outside, Bob Boreham has laid new paving, Les Holdaway has undertaken our gardening. Peter Budd designed and fitted the Weybridge Mariner's sign on the clubhouse frontage above the balcony overlooking the river. Jim (Jim 'll Fix It) Hamments now seems to be the member to sort out all the remaining niggles as he sees or via request from Andrew Cotter. We owe a lot to Ray Churchill, Roger Francis, Ian Parkinson and all those who have helped rebuilding the clubhouse. Since then the major change at Weybridge Mariners has been the establishment of moorings. This took a long period as agreements from the Environment Agency and the local council were required. Initial consent from the E.A. was obtained in 2010 but it was not until 2012 that Pat Walsh (Barge and Boat Builder and Civil Engineering Contractor) started work. Roger Francis was the WMC mainstay who drew up the plans and handled all the negotiations and reported back to the WMC committees. The work covered breakout concrete to the end of the slipway, the insertion of 4 piles with 2 walk on pontoons with cleats linked with 2 gangways on Youngman's Board. This provided accommodation for 4 berths. Later modifications to the gangways were undertaken by Jim Hamments. The following has been received via Bev Shields from probably one of the earliest members of the WMC still around. The writer is Jonathan Cooke who now lives in Fort Lauderdale, Florida. Reading the 1969 Newsletter on our website from June Griffiths triggered many memories from the past. My name is Jonathan David Cook, I was born in a V2 air-raid on London in November 1944. My mother was Julie and my father was known as 'Cookie' and when he (Stanley Lawrence) left my mother, Terry insisted on calling me 'Young Cookie'. I did not like that too much and strove to be known by my name, Jonathan. My father was a Rear Commodore for a while under Len and Maggie Outtrim, who were succeeded by Paul and Barbara Wingate. I was also the Bar person, or some title, for Weybridge Mariners Club, for a few years in the 1960's, from 1962, or '63, to 1967 or '68. I celebrated my 21st birthday party (1965) there and Pauline Lucas [Tappin] presented me with some award or gift at the time. - I think she and Terry had a daughter when they were married. Her former boyfriend was a Detective called Ron Smith, who was on the Great Train Robbery investigation. He and Terry were also friends. - There was also another local Weybridge CID man, Bert Futter. His fiberglass boat was one of the first 'plastic' cruisers; I think it was a 'Seamaster'. There were also a few 'Freeman' cruisers that looked as though they had come from a caravan factory at first. I think Commodore Paul Wingate had one of the more elegant models when the Freeman's LOA increased. When Paul Wingate (related to Major Orde Wingate) became Commodore and his sweet wife Barbara was elected as Treasurer, (my mother was Secretary, and my father had been Rear Commodore). I undertook the Rear Commodore role in the absence of my father and then became the paid bar steward. I received the princely sum of 12 shillings and sixpence per session for Friday evening, Saturday evening and twice on Sundays It was considered to be a conflict of interests for me to be on the Committee as acting Rear Commodore. (I used to make more in tips, from the Griffiths, the Shiners, the Dillons, the Tappins and the Wingates, etc, etc, than my 50 shillings.) I was considered too young to be the Acting Rear Commodore as I was still under 21 years old. However, I did go to a couple of events as R.C. At the risk of being evicted, I would take stands against the Tappin nepotistic dynasty. Although to be fair it never happened; in fact, I went on many of Terry's cruises, especially ATYC Rallies like ones at Tilbury Gravesend, or Sheerness. Terry did have the most prestigious yacht, while Len or Paul didn't. Our motor yacht, 'Pisces' being so elegant, could probably have held up, at least as number three after 'Mis'behavin' and David Prior's famous conversion of a GM powered fire boat into an express luxury motor yacht. My mother and I were Weybridge Marine tenants, we lived aboard all year round. I constantly petitioned the Wingates to make some radical moves. - I think I once suggested moving over to Shepperton Lock Island where the lone Collin Suddards had his sleek yacht moored. Originally, in the early 50's my parents had brought a 25' 6" Devonshire fishing wherry to Weybridge. We were there when Anthony Hancock's yacht, on a converted swim end pontoon broke away in a winter flood. It went round in circles on a swollen weir stream for days and then it sank of course. I remember when Vic Dillon, (George Shiner's partner in Porcelet a.k.a. 'Piglet'), rescued the actress Janet Munro who was married to Ian Hendry (The original 'Avenger'), when she was swept towards the weir above Shepperton Lock. 'George' Shiner and his brother the actor Ronald Shiner lived on Hamm Haugh Island. Their next door neighbours were Drew Henley and Felicity Kendall (The Good Life) on one side and Alex and Sue Kitto on the other side. On another occasion Shiner, Drake, Cook (no Dillon) and I went up the River Snape at Aldeburgh to the Maltings on a high tide. On the way back downstream we ran into bad weather, it was November. It turned into full gale force storm and we put out to sea, at one point passing some top secret installation on the Suffolk coast. The North Sea was very unforgiving and Piglet/Porcelet was tossed around for what seemed like hours. I didn't think we would make it back alive. My mother and I also attended the Lord Mayor of London's Special Boat Parade. - We had dinner at the Guildhall in the City and for the actual parade we were equipped with a special transitor record player with Tannoy speakers. We were instructed to play Eleanor Rigby all the way through the Pool of London, but I discovered the other side of the record was Yellow Submarine, so we played that to a rapturous reception every time we went under one of the bridges. My mother purchased a nearly finished motor yacht conversion from Charlie Hunt, who was Terry's best buddy/worker/friend. They would work on 'Mis'Behavin' all year round. They fell out eventually, probably over Pauline Lucas, although Charlie was a perpetual bachelor, or a man of mystery. His boat had actually been sold to the older brother of an actor from 'Emmerdale Farm', Frazier Hines. - The two brothers and their bookmaker father ploughed, or is that sank, a lot of money into 'Glencoe'. - My mother and her new boy friend got this conversion from Charlie for a reasonable price. This boat was famous for going in circles because it had twin engines, except one was on the centre line and the other was a wing engine. It never did steer straight! He now had a small launch and did not deal much with Terry Tappin anymore and come to think of it he hardly ever came on the Barge, the W.M.C. HQ, but then neither did Bob Tappin when he was alive. - (Charlie was either at the Lincoln Arms, or up the road at the Old Crown). Terry and his other friends, including some more show biz acquaintances of Pauline, were always down at the Bar on the barge, or across the street at the Lincoln Arms We also had memorable parties at Pauline's town house in Hurst Park at Christmas time or New Year's Eve and after some of the annual dinner dances. One time we all went to Staines for the Annual Dinner and partied afterwards on Mis'Behavin. On that occasion we had quite reasonable number of boats like Sea Ray (Charles and Viv), Porcelet ('George' and 'The Bear') and others like Don Kahn and Vic Dillon and his wife and family etc. But that's another story and before I remember any more names, with all this show biz name dropping and stories from the A.T.Y.C. Rallies, Annual Dinner Dances and other special events, I will sign off. - (We did have some good times with the 'rich and famous' and some of them were very down to earth) - I do hope I haven't shocked you with too much nostalgia but, "those were the days my friend, we thought they'd never end." The rest is history. Later, I lived in a house at Hamm Court for a while. The boat was gone. Then I lived in Chertsey at Bridge House for a few years until I flew to the US. I never lived on a boat again. - After a few years I left for the States with a girlfriend that I had met on the return trip from NY on the QE2, (I worked for Cunard in London, chauffeur to the Chairman). I left England on Friday the 15th of September 1978 and never returned. We came to Miami, Florida and after a while she took off when my Visa expired. - I married a woman from New York and we were married for thirteen years until she died in Upstate New York. We travelled in a Blue Bird Motorhome and when I became widowed, I returned to Florida, (Fort Lauderdale). How ironic that living near Coconut Grove, Miami, where there used to be many residential boat owners, that we never got a boat, just the RV. We did once look at a vintage Chris Craft, American-style houseboat in Miami, when we had money we bought the Blue Bird Motor home. I still live in Fort Lauderdale, Florida in an H.O.A. (Condo). I am retired and do a lot of writing on some subjects of an entirely different nature from reminiscing on boozin', cruisin' and schmoozing. However, you might want to fill me in on a few names of the people and boats from the 60's, 70's, 80's and 90's. I used to Google Earth the old W.M.C. H.Q. barge and see the former Dickens Class M.F.V. 'Martin Chuzzlewit', aka 'Mis'Behavin, scene of many parties and rallies. It was there until recently, along with what looked like the Barge a few years ago. Does any one remember Amy Gentry (30/40's? Olympic rowing champion) and the W.L.A.R.C. (Weybridge Ladies Amateur Rowing Club). Or the kayak slaloms on BBC Sports TV over at the Shepperton lower weir? My parents were asked to move to D'oyly Carte Island before the bridge was built, as the owner wanted some decent looking residential boats around the island. I cannot quite remember his name, but Patti O'Bryan's brother Frank, married the island owner's very aristocratic-like daughter, Anne. They lived on a long Dutch barge yacht, Rios and it had a large single cylinder diesel. Can't imagine now having to maintain litres of draught Guinness at around 0 Centigrade!! Then Terry, Fred, (the sole Weybridge Marine employee) and Charlie Hunt, built the famously named Mis' Nomer, the first of the Mis(s) hire cruiser fleet, except for the original Mis' Behavin, and that was probably Charlie's original cruiser, before his Glencoe conversion. As I have said my mother eventually bought that from him. Charlie really spent much more time on his friend Terry's yacht. I think Terry and Charlie owned Fluke together. Charlie drove a Morris Minor convertible, lived in Shepperton, (with his mother?) and worked for a garage as a mechanic. Vic Dillon's boss, Don Kahn, kind of took over Charlie's role as the chief mechanic on call for Terry Tappin, Then there was Doug Painter who owned a laundry somewhere in Byfleet, New Haw or Woking and his younger girlfriend Sue, who mostly drank in the Lincoln, but frequented the W.M.C. Bar and clubhouse. Mis'Behavin, Terry's motor yacht was one of five Dickens class M.F.V. style motor yachts, built for the Coastguard, or Fleet Air Arm in WWII. Mis'Behavin was Martin Chuzzlewit and the other three or four left after the war kept their original names. The owners of M.Y. Micawber were friends of my parents. There was one called Edwin Drood and one named David Copperfield and also another, maybe called Pip or Magwich from Charles Dickens' Great Expectations. Perhaps this one had been lost in wartime service. There was no doubt that Mis'Behavin was the most elegant one of the Dickens class in existence. The following information from Vic Lundberg was passed to me last year (2012) by Bev Shields which may be of interest. It relates to the WMC ferry that we had prior to the 'Len Outtrim'. 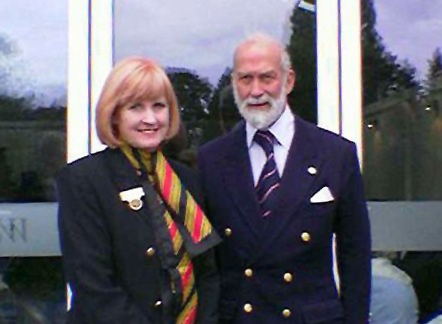 She was purchased from him by Don Creese, Past Commodore of WMC and his wife Joan, Past Secretary of WMC in 1966. For 21 years they travelled extensively in her under her new name "Amy Jane". She was moored on and travelled the Wey Navigation. Their travels included the greater part of the Grand Union Canal, The River Trent the North Oxford, the South Oxford. the Severn and Avon, the North Shatford the Kennet and Avon and the Coventry Canals. She also led a number of Weybridge Mariners boats around the London Levels. In 1987 she was purchased by Arthur Brooks, Past Commodore, for his daughter and then sold to Ian Bond in Chertsey. In February 1990 Ian's property in Laleham Reach was destroyed in a flash flood and Amy Jane sank at her moorings. On the 26th March. Don Khaan and Arthur Bond salvaged the boat for Ian. Ian intimated that he would be prepared to sell her for a nominal sum and Don suggested to the Committee that the Club purchase Amy Jane and use her as a dory. Roy Vincent brought her down from Chertsey at the beginning of June and by the 19th June Michael Walker had dug out all the silt from the innards , Don Khaan had got the engine running and Maurice Coster had removed the interior woodwork. In July Don and Joan Creese sent a message wishing her safe journeys in her new capacity as Club Dory. By the 20th August Maurice Coster had fitted new decking. Don Khaan and Terry Tappin pulled her up on Terry's slipway in Weybridge Marine for refurbishment in September. Roy and Frank Vincent covered the cabin and deck with fibre glass, Bill Tandy painted the hull and Terry Francis anti—fouled the bottom. Terry Tappin and Don Khaan fitted a rubber rubbing strip, Maurice Coster made and fitted the engine casing and steps. The name W.M.C. FERRY was applied. She was launched in October 1990 and her first work as W.M.C.Ferry was for the Laying Up Supper on the 27th October 1990, 4 ½ months from commencement of work- A great effort!. In January 1995 during flood waters Amy Jane holed herself on the new bollards outside the Clubhouse Don Khann and Paul Killick happened to spot this and with aid of the Thames Police from next door managed to pull her up the Club slipway where she was eventually patched and returned to service. Tea ad infinitum — Grace Coster. © Copyright 2010 The Weybridge Mariners. All rights reserved. Material on these pages may only be reproduced with permission of The Weybridge Mariners.